The 22nd annual 2K Classic benefiting Wounded Warrior Project began with a bang on Friday evening. The night started off with an epic double overtime game in Pittsburgh that saw Pitt eventually earn a 93-90 win over Eastern Michigan. Down 60-50 with 10:24 to play, Eastern Michigan mounted a comeback that culminated with Ty Toney’s layup with one second left in regulation to tie the score at 72-72 to send the game into the first overtime. 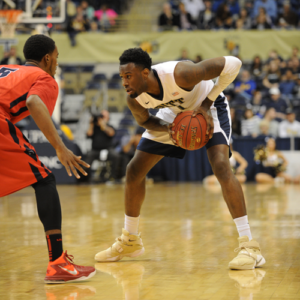 Then Pitt’s Jamel Artis free throw with 32 seconds to go tied the game at 83-83, forcing the second extra session. Trailing 91-87, Ray Lee sank a 3-pointer with five seconds remaining to bring EMU to within 91-90. After a pair of Artis free throws increased the lead to 93-90, Toney missed a 3-pointer as the clock wound down and Pitt escaped with its first win under head coach Kevin Stallings. Artis ended the game with 27 points and nine rebounds. Michael Young scored 26 points to go along with 10 rebounds and five assists. Sheldon Jeter netted 12 points with nine rebounds and Chris Jones added 10 points, three rebounds, and six assists. EMU was paced by Lee’s 27 points. Tim Bond scored 21 points before fouling out, Toney had 12 points and six assists, and James Thompson had eight points and 13 rebounds. In Dallas, the Tim Jankovich Era started on a positive note as SMU captured a 72-44 win over Gardner-Webb. SMU’s Semi Ogeleye led everyone with 26 points and 14 rebounds. Shake Milton had 13 points for the Mustangs, who also received 11 points and eight assists from Sterling Brown and 11 points from Jarrey Foster. SMU was not only successful offensively, but also defensively, holding the Runnin’ Bulldogs to just 15-of-49 shooting from the field, including 6-of-22 from three. GWU was led in scoring by Tyrell Nelson and David Efiamayi, who netted 13 and 10 points, respectively. In Ann Arbor, Derrick Walton Jr. scored 20 points and Mark Donnal had 12 points and six rebounds as Michigan defeated Howard, 76-58. Zak Irvin posted 11 points and five rebounds and D.J. Wilson had nine points and a game-best eight rebounds for the Wolverines. Howard, playing without James Daniel, who led the nation in scoring a year ago, received 12 points from Damon Collins and 10 points from James Miller. The 2K Classic benefiting Wounded Warrior Project continues on Sunday when Michigan hosts IUPUI in a noon (ET) tip on ESPNU. Later, SMU will entertain Eastern Michigan at 2:00pm (ET) on ESPN3.